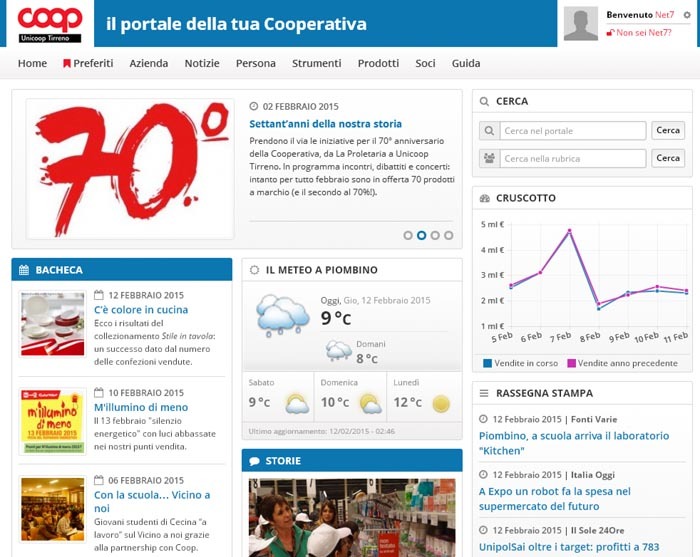 The Unicoop Tirreno Intranet is an employee Intranet with a focus on best practices. The Unicoop Tirreno Intranet is an employee Intranet with a focus on best practices. It is a powerful communication tool that involves more than 1200 employees working in 110 stores, more than a million members of the cooperative and a turnover of € 1.226 billion. The intranet collects press reviews, press releases and a set of more informal editorial content like news and “stories”. Stories are compositions of images and text used to tell success stories and best practices of the stores. Stories are contributed from each store and they are both a mean of recognition and inspiration for others. Among the traditional intranet services, the intranet provides personal and group calendars, document management, contact management, local weather reports, store locator. Intranet members can comment existing content, express preferences and create bookmark for quick access to content and services. The portal also allows a granular management of permissions and capabilities.